My food is like my family and friends ... big, bold, and beautiful. This is assertive but not arrogant food, well-seasoned and balanced in flavors and textures. Woven into my life's journey, food marks events both big and small. Each recipe encapsulates memories of good people, good places, and good times. Since adobo is this month's pick of the Kulinarya Cooking Club, a club dedicated to Filipino food, I am bringing back my unique version of adobo where I unveil my secret technique. It's unconventional, but boy, is it good! Click on Trissa's blog to find out more about this awesome cooking club. Adobo is the Philippines' national dish, and I'm sure there are as many variations of adobo as there are cooks. What adobo recipes share in common is the use of soy sauce and vinegar to create the characteristic salty and tangy flavor that melds so well with steamed white rice. I like my chicken a little crispy, so after the chicken has stewed, I pan fry it on both sides and I don't fully immerse it in the liquid afterwards. I also add a little ketchup or hoisin sauce as a glaze on the chicken before I pan fry it, so that the sugar in the ketchup or hoisin sauce caramelizes and adds another layer of flavor. It's unconventional and I'm the only one I know who does this. It's been my secret ingredient -- until now, of course. I also use chicken with the skin on, because there's nothing like crispy skin. But you can certainly cook adobo with skinless chicken and still get the benefits of browning during the pan-frying stage. 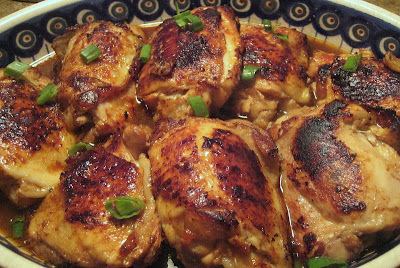 For me, chicken thighs are the cut of choice for chicken adobo as the thighs stay moist during the stewing process. When I make chicken and pork adobo, I prefer to use country style pork ribs for the same reason. I like to cook with the bone in, as the natural collagen in the bones add body to the sauce. If I decide to cut up the chicken in bite size pieces in advance, I still will add the bones to the stock and then will remove them after the meat has stewed. If you have leftovers and put them in the refrigerator, the sauce will gelatinize the next day. That's good. When you heat it up, it will melt again -- heaven over rice. I will note that this recipe is probably not a recipe as much as a starting point for a dish that will be instantly recognizable to adobo lovers around the world but is infinitely changeable, depending on the cook. Even my adobo is never exactly the same from day to day, because while I loosely follow the general proportions and procedures below, my adobo can be tangy or less tangy, have a brothier or thicker sauce, contain chicken or pork, or chicken and pork, etc. The point is there's no right way -- just what you like. *If you're not sure how tangy or salty this dish should be to suit your palate, decrease these amounts to 1/4 cup soy sauce and 1/4 rice vinegar. You can always add more later. Or go ahead with the recipe, and if you find it's too salty or vinegary later on, add more chicken broth and thicken the sauce with a little cornstarch mixed with water. Marinate meat in soy sauce, vinegar, bay leaves, garlic, and peppercorns for 30 minutes or overnight. If you don't have time to marinate, that's fine. Proceed with the recipe. Put meat and marinade in pressure cooker or dutch oven/pot. Add chicken broth to cover meat, adding more than in the recipe if needed to cover the meat (you can use water instead if you don't have more chicken broth). Cook covered for 15 minutes in the pressure cooker, 30-40 minutes in dutch oven/pot (it can cook longer without any downside, and the chicken is probably cooked through in 20 minutes if you're in a rush; I always cook it longer, because I never remember to marinate the chicken in advance, so this gives the chicken a little longer to stew in the marinade). The chicken should cook at a low-medium simmer, similar to when you cook a stew. You don't really want it to be at a rolling boil, although if it happens, the world won't end. 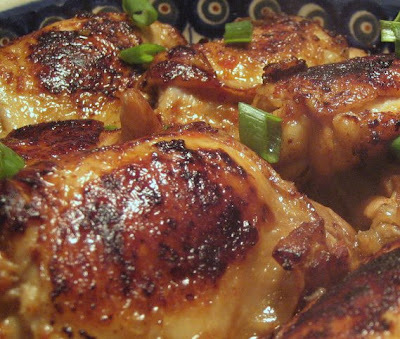 This recipe is very forgiving because of the use of chicken thighs. Take out meat and put on a platter covered with paper towels. Strain sauce of garlic and peppercorns and defat (I use a gravy separator, but you can also skim off the fat with a spoon as the fat floats on top of the broth). Boil and reduce by half. As the sauce reduces, taste and adjust seasonings as necessary. For example, if it's getting too tangy for your taste, don't reduce it as much. Or if it needs more salt, add more soy sauce or salt. While sauce is reducing, pat chicken thighs dry on top and on bottom (the paper towels on the platter should have absorbed most of the liquid on the bottom). Brush both sides with a little ketchup. Heat non-stick skillet over medium to medium-high heat and add a couple tbs. of oil when it's hot. Place ketchup-glazed chicken skin-side down in the pan; put as many chicken thighs that you can fit in the skillet but not so many that they're touching each other, as they need air flow to fry (if you have more chicken than can fit in the skillet, cook the chicken in batches). If you have a splatter guard, cover the skillet after you've added the chicken. The chicken will spit a little (or a lot if you didn't pat it dry). Leave if for a couple minutes, using your tongs to check it to see if it's browning and getting crispy. Adjust heat as necessary if the chicken is either browning too quickly or not browning at all. When it's brown on one side, turn the chicken over, so it can brown on the other side, following the same procedure. If you want to brown the sides of the chicken on the skin side, you can do that too, by balancing the chicken on its side against other chicken, the side of the pan, or by holding the chicken on its side with your tongs. Place browned chicken in bowl or casserole dish when done. Pour reduced sauce over chicken and serve with white rice. Clockwise: Chicken in vinegar-chicken broth mixture before it is stewed; brushing cooked chicken with ketchup, my secret ingredient; browning the chicken skin-side down; browning the other side of the chicken thighs. Browned chicken in its stewing sauce, which has been reduced by half. Your blog is awesome, excellent informations are shared. Your blog is useful for our visitors. As our website is similar to your blog, it will be beneficial for you. Take advantage of the seaworld san diego to book not only Discounted Hotels but also Hot Deals on Attractions, Tours and Restaurants. that looks great...and how wonderful n generous that ur sharing ur secret!!! I love the idea of pan frying after steaming!! It looks delicious. Oh boy, GENIUS is what you are. What a fantastic tip. Thank you!!! 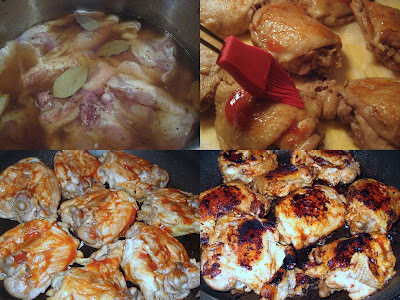 Great tips for preparing authentic Filipino Chicken Adobo. I will definitely be trying this one! I now have a sudden craving for Lumpia too. A blizzard is headed our way...might be the right time to do some Filipino cooking at our house! You really did get a gorgeous color on your chicken! It looks fabulous! It looks delicious, it is a very original recipe, I will try it this weekend to surprise my wife. Really nice and looks like delicious foods. Some hotels offer free foods but some for an extra cost. Thanks for stopping by. I hope that you find something here that you'll want to try. Want an easy and hassle-free way to get updates? Subscribe using the RSS feed above. If you want to use one of my pictures or recipes on your blog or website, please reference this blog as its source. All content on this site is copyrighted. Hey Mom, What's for Dinner Tonight? Food Techie: Food & Science. Innovation & Ideas. all content at www.bigboldbeautiful.blogspot.com by Ninette Enrique is licensed under a Creative Commons Attribution 3.0 United States License. Based on a work at www.bigboldbeautiful.blogspot.com. I'm a fundraiser-cook or a cook-fundraiser. Either way I have two great passions, and that's philanthropy and food. Both are about making a difference and about nourishing the body and spirit. Both are about giving. And when done with passion and lots of love, the results are always fantastic. I'm proud to be a Filipino-American, and I believe in the power of positive thinking and in the connectedness of all people to each other.